Delicious protein-packed pancakes that sneak in a serving of veggies as well! Grate zucchini. Mix all dry ingredients in a bowl. Add egg whites and zucchini and whisk thoroughly. Add in almond milk slowly until it reaches batter consistency. 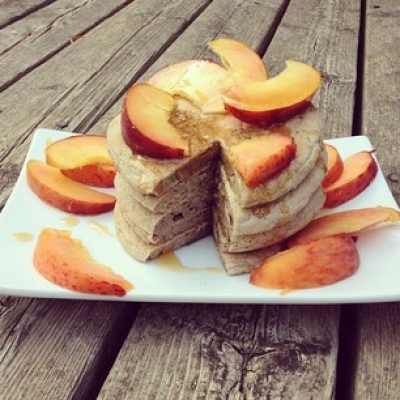 Cook like pancakes, top with sliced peach and maple syrup (optional).